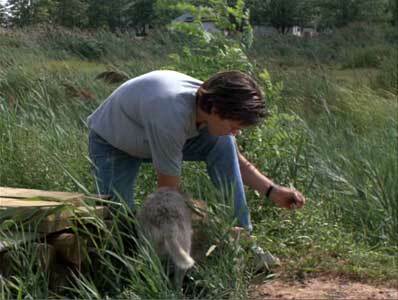 River Phoenix wears black and optical white high top Converse “Chuck Taylor” All Stars in the film. As Danny laces his black chuck high top, he and Lorna talk about their romantic interests. Running on Empty is the story of the Pope family, a married couple and their two sons who have been living in the underground and avoiding the pursuit of the FBI since the late 1960s. Annie (Christine Lahti) and Arthur (Judd Hirsch) were onetime radicals who blew up a napalm factory. Although their intent was to protest the U.S. war effort in Viet Nam, by accident a janitor was in the building when it blew up, who ended up blinded and paralyzed. On the run ever since, they have become family of nomads, cut off from a normal world of relatives and friends, changing towns at the first hint of pursuit, expert at how to acquire menial jobs that don’t attract attention, clever in their use of community resources, and surviving with the assistance of old radical friends and acquaintances who occasionally still help them out. The Popes have two sons, Danny (River Phoenix), who was two years old when the bombing occurred and is now a high school senior, and Harry (Jonas Abry), a ten year old, who have never known any other kind of lifestyle. As the film opens, the Pope family has to deal with Danny and what his future will become. 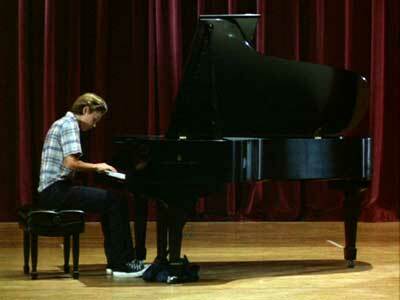 Danny is a talented pianist, in fact so gifted that when Mr. Phillips (Ed Crowley), his music teacher at the latest high school he attends hears him play a Beethoven sonata, he is so impressed that he wants to promote him among his circle of musical friends and encourages him to apply for admission to the Julliard School of Music in Manhattan. But for Danny to be accepted, he must submit a complete list of his high school transcripts, which will reveal the many aliases his family has used over the past years, providing a direct path to his parents that the FBI could pursue unless he completely severs all contact with them. Annie and Arthur Pope face the painful choice of keeping their family together and preventing Danny from realizing the future of his dreams, just like their dreams remained unfulfilled, or letting him surface from their underground world. Danny gives one of his chucks to their dog to take to his brother as a signal the family is leaving town. Life in the Pope family consists of simple pleasures contrasted with crisis responses to the ongoing pursuit from the outside. Arthur runs the family in an autocratic manner, making all of the decisions, training his sons how to live anonymously (even remembering to stay home the day of the school picture), and maintaining a fortress mentality suspicious of all outside contact. A telling scene of the futility of their lives occurs at the beginning of the film. One minute we see Danny playing baseball, the next minute the signal has gone out that it is time to leave town. The Popes immediately drop everything, abandon all of their possessions except for the clothes on their back and Danny’s portable practice keyboard, assemble at a designated meeting place, and take off. Even the family dog is left behind, with the remark “I’m sure he’ll find a good home.” When they arrive at their new location, in New Jersey, the Popes quickly adapt to their new surroundings. Both Arthur and Annie are able to get jobs the first day, where they are paid in cash, and Arthur quizzes the boys on their new names and identities. When Annie registers Danny for school, she glibly explains that his transcripts were lost during the move, and she will be writing for a copy (although of course she never will). You see Arthur come home with a bag of clothes that he got from various lost and founds or thrift stores, and Annie brings the boys a Walkman and a game so they have at least one new personal thing. All of the adversity that they faced from the outside has made them a very close family unit; their lack of materialism and the attention that they pay to each other has made them surprisingly well adjusted and likable people. Danny imitates a rock and roll guitarist to the surprise of Lorna. As the story line develops, it focuses on Danny’s coming of age. For the first time in his life, a real future is dangled in front of him in the form of a scholarship offer to Julliard, and Danny meets and eventually falls in love with Lorna (Martha Plimpton), Mr. Phillip’s daughter. Danny is at a crossroads — he would like to confide in Lorna, but he is afraid to for the sake of his family. Lorna is intrigued and then frustrated because she cannot penetrate the wall of secrecy that Danny has been encouraged to build up his entire life to resist outsiders. Arthur is opposed to Danny’s wish for a musical career. He thinks that the world of classical music is full of elitists and would rather Danny attend a rock concert then go to Mr. Phillip’s chamber music recital. But foremost in his mind is the survival of the family, regardless of the consequences to his sons. Annie wants Danny to have this opportunity, because she cannot bear to see him denied a future like she was. This tears her up emotionally, because she takes personal responsibility for his situation, and feels that she must act to do something about it. Danny would like to pursue his dreams and stay with Lorna, but doesn’t want to be the one to break up his family. The remainder of the film deals with how these conflicts emerge and are resolved within the context of the Pope’s day to day survival. Besides the family turmoil, there is another interesting subplot to this film: the discovery of how Danny’s extraordinary musical talent was developed and nurtured and where his musical roots come from. Danny and Lorna embrace after Danny confesses his true identity. Running on Empty is a well cast, well acted film that leaves you thinking long after the final credits. The film is thoughtfully crafted so that we learn a lot about each principal character, even ones like Annie’s father (Steven Hill, best known as the first district attorney on Law and Order) who only appear for a few minutes. Both River Phoenix and Christine Lahti received Oscar nominations for their terrific acting work in this film, and Lahti received a Golden Globe award for best actress. River Phoenix was nominated for Best Supporting Actor (in the strange Hollywood system which never really deals correctly with juvenile actors. This film is clearly about Phoenix’s character Danny: he appears in nearly every scene, and you would think he would have to be considered the lead actor), and this is one of the finest performances of his brief career. It is even more amazing when you consider that Running on Empty was made only two years after Phoenix’s appearance as the eleven-year-old Chris Chambers in Stand By Me. Judd Hirch’s performance as the unrepentant sixties radical Arthur Pope shows a very different side from what we were used to in “Taxi” and other television comedies. Christine Lahti delivers a strong, emotionally wrenching performance as the mom torn between the consequences of her past and how it is affecting the future of her two sons. Martha Plimpton as Lorna Phillips starts out being the iconoclastic voice of reason, as she deals with the secretive Danny, and the curiosity of her father as he tries to find out about Danny’s musical background. When she and Danny fall in love, she demonstrates some real passion as she helps Danny to find and voice his own desires. Director Sidney Lumet deserves a lot of credit for giving us a taut, suspenseful, and emotional work that uses ideas and dialogue to create the tension instead of the usual special effects and chase scenes. For instance, the pursuit of the FBI, who are tracking down the Popes for their political crime, is felt throughout the film even though we only see FBI agents in a government vehicle once in the opening scene, and never in closeup. The drama of this work is expressed through the painful choice faced by the Popes: do they stick together at all costs, and continue a life of deception and flight from the authorities, or do they break up so that their sons can have a future, and live freely in open society. While waiting backstage at Julliard, Danny discovers a photograph of his grandmother. River Phoenix, in his role as Danny, wears high top chucks throughout the film. In the opening and ending scenes, we see him in well worn white chucks, but during the inner majority of the film, he wears new looking black high tops. Chucks seem to be one continuity in Danny’s vagabond life. Often the family would uproot and move to a new town with just the clothes on their backs, and perhaps one or two personal items, but he always has his chucks. They are never photographed in closeup, but they do have some significance in the story line. For instance, at the beginning of the film, Danny unties one of his chucks and gives it to their pet dog to bring inside and signal his younger brother Harry that it is time to drop everything and flee the town they are currently living in. In another scene, when Danny is about to confess his true identity and background to Lorna, they go out into the back yard of her house, and after she tells him she is barefoot, he gives her his chucks to wear. During their walk in the woods scene, when Lorna and Danny’s relationship first becomes serious, you see him lacing up while they talk. When Danny must dress up for the chamber music recital or his audition at Julliard, we see him wearing a plaid shirt, cloth tie, dark pants and jacket, and his black high top chucks. Of all these scenes, the Julliard audition gives you the best chucks photography. 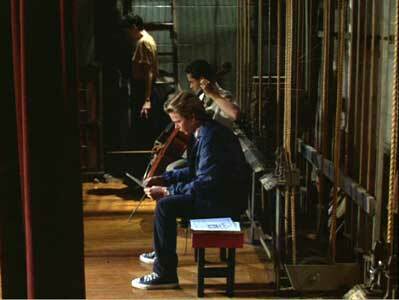 Danny auditions for admittance to the Julliard School of Music in New York. Running on Empty. (1988) Christine Lahti, River Phoenix, Judd Hirsch, Jonas Abry, Martha Plimpton, Ed Crowley, L.M. Kit Carson, Steven Hill. Directed by Sidney Lumet. Categories: Drama, Coming of Age.